Generation Z is about to change the face of the workforce. Forbes shares how you can prepare. People in open offices feel spied upon, distracted, and depressed by their workspaces. Fast Company reports on a new survey that will surprise no one. WeWork has changed the narrative around corporate real estate, says Bloomberg. How are the world’s biggest companies planning on catching up? 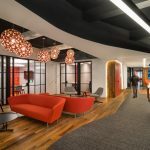 JLL Real Views discusses how as today’s companies aim to become more agile and their workforce more mobile, their space requirements are changing fast. Open offices: So many places to collaborate. So few places to weep in private. The New York Times provides us with some comedic relief at the expense of everyone’s least favorite office layout.